Gideon Haigh is commonly accepted as being one of today's best writers and has written three previous Ashes accounts all of which have been acclaimed and excellently written. 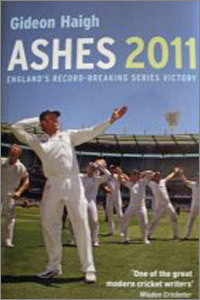 Fewer books came out about England's famous Ashes series victory in Australia in 2010-11 than the 2005 series but it was reassuring to see one by Gideon Haigh. This book comprises Haigh's daily writings on the Test series for Business Spectator and The Times which therefore means that the book is not written with the benefit of hindsight. Part 1 of the book covers the lead up to the First Test - and quite a considerable lead-up which starts with Haigh's first missive on the 5th October and the Test starting on 24th November - and then has a preliminary piece for the day before each match. This format is carried through all five Tests. At the end of each Test there is a decent scorecard which also covers the number of boundaries scored and no balls and wides against each bowler and the statistical section at the end is also more than adequate for the averages. Although there were doubts that England would win back The Ashes in Australia for the first time in twenty four years, it is interesting to see from the Averages at the end of the book that, in the five Tests, England used thirteen players whilst Australia had seventeen. We all know what happened now but, to relive it as it happened and through an excellent writer, this is the book to read. It is also very reasonably priced.